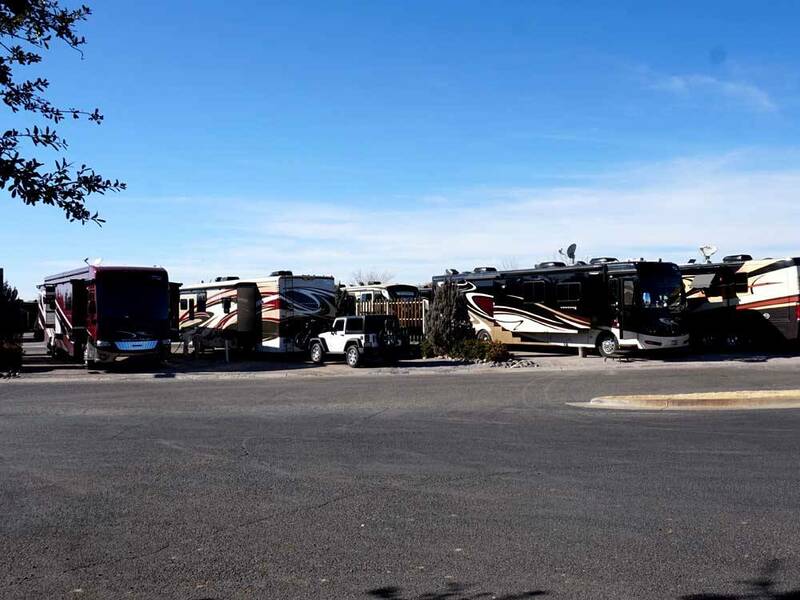 Very nice RV park, located near old town Mesilla, and close to central Las Cruces. Level, long sites. Utilities worked. WiFi and cable are surprisingly good. Clean and nicely landscaped. Pull through sites are arranged back to back, so neighboring slides are uncomfortably two to three feet apart. For those that complain about highway and railroad noise, we had no issue as the noise level is what it is for a park conveniently located adjacent to highway frontage. But, a resort should be more than a fancy word for higher prices. This "resort" is lacking several basic resort amenities, big and small. Recreation facilities are minimal. The park has no children's play area and no pool. This "dog friendly" park has no dog waste bag dispensers. It has no propane service, as in no on-site propane and no outside delivery service. (Do a full disconnect and go to your local propane dealer.). There is no recycling. The desk clerk blamed the guests for the lack of recycling because the guests didn't follow the rules. Aside from the wisdom of blaming guests for the park's deficiencies, if they have maintenance people that will pick up dog poop (see other reviews), logically, these same people could assist guests in any misguided recycling efforts. In any event, because a resort should go beyond basics and provide those additional systems that serve the needs of their guests and protect the environment, I felt the price was a high and the park rated a 4, rather than a 5. We stayed here in our 41' 5th Wheel. Check in was easy and the people here are great. The sites are very nice and clean with room to sit outside and relax. It was quiet and they had a large dog run for our dogs which was lighted at night. We did not use the facilities but the areas near the office were very clean. We would stay here again if passing through. Stayed in September in 35' class A with toad. Perfectly level packed gravel sites. Good hook-ups. Did not use facilities. Excellent long dog run - lit at night. They pick your garbage up for you if you leave it by curb. Very quiet even with close proximity to freeway. Would definitely stay again if passing through. This is a very nice park. The sites are immaculate and spacious, with swept gravel. The roads are all concrete, with ample room for big rigs to maneuver. The location is very convenient. They are next door to a Holiday World and very close to Walmart and many restaurants. The staff is very friendly and the park provides discounts for several restaurants in the area. Cubside garbage pickup is a nice touch. The hot tub is very nice, but would be even better if there were also a pool. We will definitely return. This is a pristine clean and tidy park. Office staff super friendly and helpful. Sites are swept smooth fine gravel. Nice hookups. Good WiFi and cable. Great clubhouse with comfortable, couches and quiet atmosphere. Should be a Good Sam rating of at least 9. Probably a 10. Loved this place, the people at check in were friendly and helpful. the place is very well taken care of, the hot tub is great and the facilities are very clean. The showers and restroom are clean but very small unless you use the handicap showers. We walked to the town and it was nice and we went to the Luna Rosa restaurant (the RV park has 10% discount coupons) which is a pizzeria and winery and it was one of the best meals we have had in a long time. the wine was great and so was the pizza, the gelato also looked wonderful but we were too full to eat it. Great park and location. Loved everything about this place. We called ahead for reservations but arrived after hours. They made it seamless for us. The dog run is the largest I have ever seen. Every aspect of the property is clean. The staff was very friendly. There is a cute little store with knick knacks inside too. Immaculate park, friendly staff, clean dog run, site was perfectly level and spotlessly clean. Easy pull through sites. Will definitely stay again. Our water hose had frozen in Junction, TX and cracked the fitting so we used the showers and they were clean and had plenty of hot water - YEA! Looks to have plenty of close restaurants and shopping. Full park but nice place. Almost too short a site for us towing into a pull through standard 57'. (MH is 38' and towing Jeep Liberty) Sites are pretty close together. The road is paved. Sites are gravel/dirt and level, neighbors are close. The site has 50,30,20amp FHU. The entire facility is very clean. Rules in place to keep it that way. Most sites are pull through. No picnic table. Showers are clean. However, they are tight. But the shower head is nice and water is hot. There is a club house, workout area, spa. Need an andela card to enter shower, workout, spa. Did not see a pool. The card must be returned upon exit. AT&T LTE service is good. The wifi seems good during the day, but bad at night. Has cable but it is not clear and analog. Has "dots"/kinda like static but dots move. The place appears nice until you begin to see the sutle things that make it not perfect. Those things including the cable and wifi make it not worth the money. It is easy in and out. They sale ice. There is road and train noise with whistle. OK for a few nights. We'd stay here again because it is clean and safe. We stayed a couple of nights here, passing through the area. The camp spots are a little larger than others we had stayed in lately, which was refreshing. They also have privacy fences/shrubs between units facing each other. Staff is friendly. I would recommend staying here. The spots are all level and all gravel, which are groomed prior to your arrival. If there was a concrete pad or grass, I'd have given them 5 stars. This is a nice, well maintained park with sites that are packed together like sardines. There are also no walking paths to reach the amenities, which are very nice. That's not such a big deal if you're taking a leisurely stroll but extremely inconvenient if you want to reach your destination quickly. The complete lack of privacy and poor access to the "clubhouse" was disappointing. For a resort--they provided NO table or chairs and the dog run was so full of dog crap I would not walk my full coat Shih Tzu there. Husband walked the other short hair one of ours there and had to side step piles too many to count. It was little more than a dirt and stone parking space with a few bushes. Never again. I believe we could do a lot better for the price. Only stayed 1 night and did not use facilities. Gravel parking, clean park. This place is fabulous!! The staff is very friendly and helpful. The park is clean and well landscaped. The hot tub is HOT!! (Love that!!!) The showers are individual and plush. It is very comfortable here! It is close to shops and restaurants. I little noisier than I would like, but not too bad. The mountains are beautiful here! So far, we love Las Cruces! I was looking forward to staying here as the reviews looked promising. We were quite disappointed as price didn't reflect what you got. The sites are gravel, very close together even with a fenced barrier, so when the slides were out we had some be just 1 foot away! Although we booked a week, the rigs on either side of us came & went as overnights. One came in at 1:30 a.m. & left at 7:30 a.m.! Noisy! There were several other equal open sites available in front of us & in other rows, so why did they put them on either side of us everyday? There is no grass or greenery at any sites (I know it's NM but others did). Plus side = convenience to great restaurants & freeway access (but truck noise a problem at night). Very long fenced dog area along the whole side of the park. Lighted at night. (Altho' bags & garbage cans provided, poop all over the place. Yuk) & not their fault). Main building was done nicely & coupons to nearby shops & dining available. No pool but had a hot tub. Outstanding facility, clubhouse and washroom/showers clean and private, sites concrete and level with good spacing and privacy. Staff friendly and helpful. We stayed 2 nights passing through the area to visit the nearby National Park Service sites. 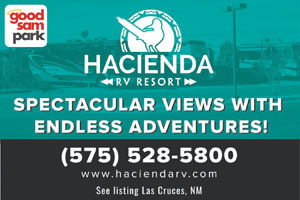 The park is a short distance from I-10 (Exit 140: Avenida de Mesilla). Although I-10 is visible from the road in front of the park, there wasn’t any traffic noise in the park from I-10. The roads from I-10 to the park are paved and in pretty good condition with some times of high traffic volume. The sites are a mixture of back-ins along the outer edge and P/T’s in the center. The back-in sites seemed to be the extended stay tenants. The interior roads are paved, wide and turns were easily negotiated. Site parking pads are compacted gravel. They are slightly elevated so at the transition from the road to the pad was a bump like driving over a rounded curb. The P/T sites were long enough for coaches & their toads. This park understands the simple concept of the importance of a flat, level site as the sites were generally level. Distance and some hedge rows with fencing establishes privacy between the sites. The site configuration has sites sharing the same utility connection space so if you don’t pay attention when pulling in you could end up on the wrong side for the utility connections. They have full hook ups – water, electricity (50/30/20 AMP), & sewer. The utility connections were towards the middle of the sites. Don’t remember an outside table and no fire pits. But the clubhouse had a couple of fireplaces/pits. Very few trees in the P/T site area but there were some around the back-in sites so satellite reception would be dependent upon site assignment and your dish configuration. The park brochure showed more than 60 cable channels. Didn’t try to get any broadcast channels. The park provided WiFi was difficult to maintain connection as the pages wouldn’t fill in. The park was not full. It was password protected. Our Verizon WiFi hotspot worked well. Didn’t try the NET10 phone so don’t know about the reception. The designated fenced pet area was along the southern edge of the park. It was lower than the rest of the park. The water runoff from the roads seemed to empty into the pet walk area so it could get muddy. The pet area was adequate to exercise a dog and there was sufficient area to walk dogs along the park roads. There were bag dispensers and waste collection stations in the pet area and around the park to dispose of waste. For being in a hazardous/severe weather area, there was no underground storm shelter. None of the structures in the park were identified as a severe weather shelter. The clubhouse & hot tub amenities and park’s appearance made this a pleasant stop over. We would stay here again if the need arose while traveling through the area. Very nice and clean. Great store. Laundry room nice. Need a few more trees or bushes between sites for privacy? 40ft 5th wheel and first year out with it. Pull through sites very easy access and exit. Gravel sites but are highly manicured and maintained. Every morning vacant sites are raked. Fenced dog runs are nice. Curbside trash pickup. Hookups in center of site making it easier for longer rigs to hookup. No tables on sites, but wooden fence dividers between sites. Very nice park and we will be back again. Nearby Walmart. This is a very nice, well kept park. Very accommodating and responsive. Very neat and clean. Easy access to highway and shopping. Good cable, had wifi booster so that was good. Good privacy and great dog run. Used laundry facilities as well. Friendly greeting on arrival; easy in and out; excellent site arrangements with all hook-ups easily available. We stayed one night going west; but returning in December 2015 we stayed two nights. We will be back when passing your way again. Very nice park, with large site that are separated by fence and shrubs to give privacy. Facilities are very clean and nice. Pet area is large, and available the entire park. The only downside to the park is the wifi is slow to not available. We stayed at Hacienda over Labor Day weekend with friends from Texas. Our trip was for our annual Hatch Chile run, we had not stayed here before but this will be our short term home from now on. Very nice park, clean and well maintained, staff could not have been nicer !